Happy Friday, Element! For our third week of #TeamTakeover, we’re introducing you to Charla, another one of our awesome Leasing Consultants! 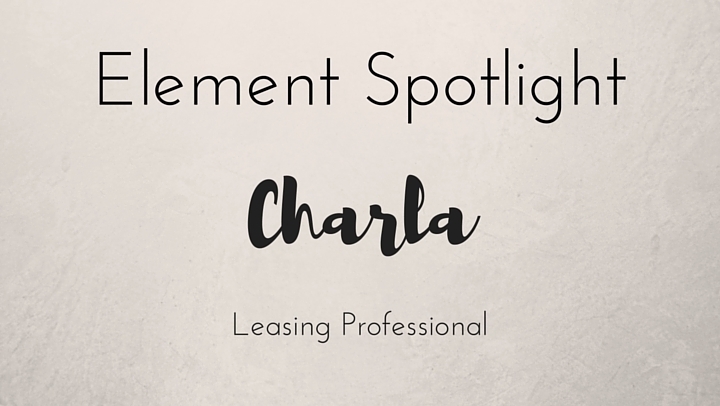 Let’s get to know Charla! Social media, I like being in the know. What’s your favorite food you can’t live without? Seafood! Crabs, mussels, clams, fish, scallops, you name it... anything that’s in the ocean, I’ll eat it. Favorite store to shop at? There are way too many to name but I LOVE horror films. Freddie Mercury, because he is one of a kind. He was passionate, talented… he was just amazing! If you were stranded on an island, what would you bring with you? Discover new bars/restaurants around town with friends. If you could go on vacation tomorrow, where would you go? Hawaii, I’m all about the beaches and the food. Where is your favorite place to grab lunch in the neighborhood? Panera Bread, I love the Mac N Cheese. What’s your favorite Element amenity? The Cave! It’s a good central spot to chill outside, especially on a warm day!